empower and inspire Lakeland’s current and future generation of leaders. Planning for the future requires an understanding of the many different components of the community. Leadership Lakeland seeks to provide this understanding to community leaders, today and tomorrow. 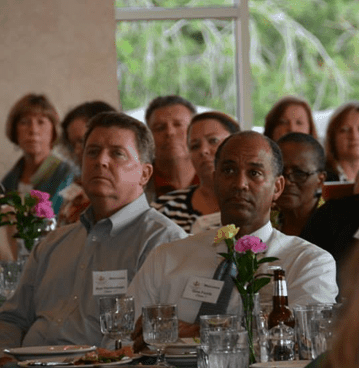 Established by the Lakeland Area Chamber of Commerce, Leadership Lakeland is an annual program designed to identify and enhance the leadership currently existing in our community. The program unites leaders from diverse backgrounds and perspectives in order to increase their understanding of community issues and improve their ability to lead effectively. "I know of no single formula for success. But over the years I have observed that some attributes of leadership are universal and are often about finding ways of encouraging people to combine their efforts, their talents, their insights, their enthusiasm and their inspiration to work together. - Queen Elizabeth II"
Leadership Lakeland focuses on major areas of interest and concern, such as government and politics, economic development, the environment, criminal justice, business, education, communication and the media, health and social services. The organization offers its members a broad range of experiences and insights about the community: its people, its needs, and its services. Identifying existing and emerging leadership from various geographic, ethnic, occupational, and economic segments of the community who have a sincere commitment to remain in the Lakeland area. Acquainting these participants with a wide range of community issues, resources, and opportunities that exist in Greater Lakeland. Increasing the leadership skills of the participants and developing “esprit de corps” among them which will provide a common ground for working together on present and future Chamber and community projects. Providing the participants with the opportunity to meet and enhance ideas with each other and existing community leaders. Assisting participants in finding placement in volunteer roles in the community. Orienting the participants about the programs of the Chamber of Commerce and future involvement. The Leadership Lakeland program is the Lakeland Chamber’s commitment to Lakeland’s future. Providing extraordinary learning experiences, inspiring community participation and leadership, cultivating and invigorating leaders in Lakeland. To inspire the leader in you. has donated more than $50,000 to nonprofit organizations since 2009.